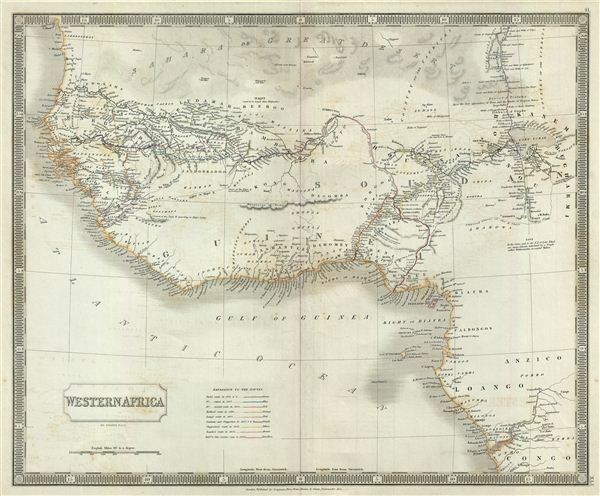 This is a beautiful map of western Africa from Sidney Hall's extremely scarce 1835 New General Atlas. It covers the entirety of western coast of Africa from River Zaire or Congo west through the Slave Coast, Gold Coast, Ivory Coast, Guinea, and north past the Grain Coast and Senegambia as far as the Bank of Arguin (Banc d'Arguin). Hall names numerous African tribes and nations throughout, and offers other interesting cartographic annotations such as the 'source of the Niger River according to Mr. Park' (Mungo Park, whose exploratory route is noted) and another 'source of the Niger River according to Major Laing' near the Mountains of Loma. It offers interesting inland detail along the Niger River as far east as Timbuktu, with the 'supposed direction of the Quorra or Niger' rendered somewhat correctly emptying into the Gulf of Guinea. West of Timbuktu the city of Walet (said to be larger than Timbuctoo) is also identified. The continent is partially bisected by the dramatic and mythical Mountains of Kong, which, based upon the explorations of Mungo Parks, were presumed to be the southern barrier to the Niger River valley. Hall to his credit reduces the Kong mountain range considerably over the expansive range depicted in earlier English maps by Thomson, Pinkerton, and others. To the east Lake Tchad (Chad) is well mapped. The supposed course of the River Shary is also noted just to the south of Lake Chad. Very good. Original platemark visible. Minor wear along original centerfold. Blank on verso. Minor offsetting. Rumsey 4224.042 (1830 edition). Tooley, R.V., The mapping of Australia and Antarctica, 2nd ed., p. 92-93, no 687. Philips (Atlases) 758. National Library of Australia, 2113921; MAP F 514; MAP NK 10750/1; MAP RM 741; MAP T 687. Ristow, W., American Maps and Mapmakers: Commercial Cartography in the Nineteenth Century, p. 303-09.